At the heart of commercial music as we know it is the mighty dobodobo rhythm. Why is dobodobo the mighty rhythm? musical way to count 1-2-3-4.
simple way to say 4/4. Which is the the simple meter that Western music favors. simple way to say and read a measure (or bar) of four quarter notes or four crotchets. basic rhythm at the heart of all the other rhythms that you hear, see and want to play. Did I say all the other rhythms? I said, all the other rhythms. All other rhythms come back to dobodobo. What is the most basic music rhythm? What is the most basic drum rhythm? What is the most basic bass rhythm? What is the most basic vocal rhythm? What is the most basic guitar rhythm? What is the most basic song rhythm? Ever tried to write without an alphabet? That's like trying to learn music without learning dobodobo. Dobodobo has two meanings: a specific meaning and a general meaning. Dobodobo specifically is the four quarter note rhythm. Dobodobo generally is the vocabulary of 16 plus rhythms that derive from the specific dobobodobo rhythm. As you learn them you will know their two meanings like the back of your hand. How do you learn dobodobo? Here's the lightly dusted version. Watch this video. Several times. Download it if that makes repeat watching easier. 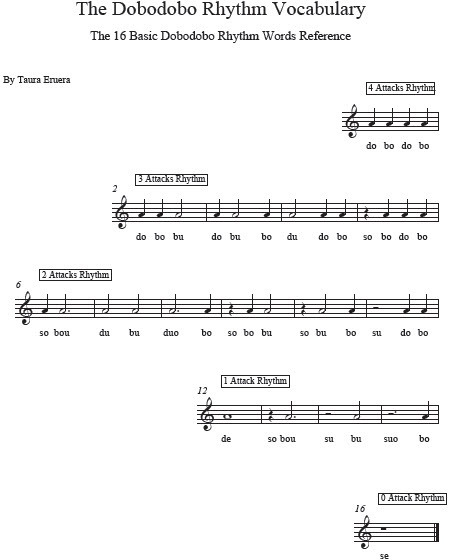 Download the Dobodobo rhythms pdf and keep it on your computer screen or print it off for handy reference. Talk along with the video. Download the pdf version of the Dobodobo Rhythm Vocabulary here. The instructions before the video will get you started. If you want only a lightly dusted introduction to the dobodobo's then you should proceed to the dabadaba's. If you want a rock solid foundation for all the other rhythms, keep reading. How do you learn dobodobo step-by-step? Here's your four part, how to learn dobodobo's, strategy. You have learnt to say and play the Dobodobo's at a mistake free tempo. You can now read all the dobodobo songs on the market. And all the doodobo parts of all songs in the world. Now that you know your dobodobo's you need to strengthen your dobodobo conversational ability and your dobodobo reading ability. You might think there's a lot of easy dobodobo readers out there right? And this system consists of a dobodobo workbook and 16 DVD tracks. In section one you learn to talk dobodobo's in all different combinations. No dobodobo rhythm combination will phase you after that. 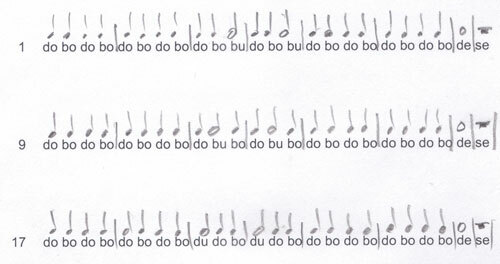 You turn dobodobo words into music notes. In section three its just you and the music: no words. No dobodobo's. Just you. Each of these 16 Video ebooks walks you through every page of the book. No video exceeds six minutes. So you can get through three a day. And finish them all in five days. Which is why mp3 audio tracks are also included. You can load these onto your mp3 player and talk the dobodobo's in between your favorite tracks. You can load your dobodobo tracks into a transcriber like Amazing Slowdowner or a free music program like Audacity and speed the tracks up. So that you're hearing, thinking, talking and reacting with dobodobo's quicker. And quicker. Of course, you can load these into your mp3 player too for mobile dobodoboing. Where do you get this Dobodobo System? This USD $118 system is available to you for $27 USD.